Not since The 7 year war had Europeans taken the piss on American soil as much as they did at the weekend in Michigan. The European team clinched the 35th Ryder Cup 18½-9½, their biggest margin in the 77-year history of the competition and let me tell you, it has been a pleasure being at work today amongst the septics. I picked up a few bets although no one gave me odds despite my best efforts and their overwhelming confidence leading up to the event. In the world's top 20 rankings only 3 Europeans feature whilst there are 9 American's. 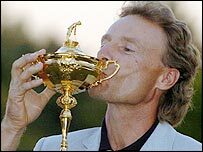 At the 18th hole the finishing players were met by a 'soccer' styled frenzy as the Europeans sung such classic's as, "When Bernhard goes up to lift the Ryder Cup, we'll be there, we'll be there," whilst the Yanks skulked home in their gas guzzling SUV's. When asked if there might be a few beers afterwards Darren Clark replied, "It's 1745 now, we've got to be in the hotel lobby at 0545 for our flight, so we've got 12 hours," Love it.